The next Federal election will be held during May 2019. It is difficult to remember an election that potentially has so many impacts on investors. Mark Draper wrote this article for the Australian Financial Review which was published during the month of March 2019. As if worrying about potential changes to franking credits and capital gains tax discounts weren’t enough, there are a myriad of other potential changes that investors need to think about should Australia have a change of Government at the next Federal election, as is widely anticipated. Normally politics doesn’t usually need to feature prominently with investment decisions, but we suspect that this Federal election will bring politics to the top of mind for investors. Here we examine some of the sectors that are likely to be impacted by the election. Nathan Bell, (senior portfolio manager Intelligent Investor) says “If Labor reduce the CGT discount to 25%, that could drastically reduce demand for investment properties, which has already collapsed due to falling property prices and tighter lending. This would be very bad news for the banks (and mortgage brokers and other lenders), which need to increase the size of their loan books to grow earnings.” The banks could also face a higher bank levy from either side of politics as a politically acceptable way of funding election promises, particularly following the Royal Commission. The ALP has proposed a cap of 2% on private health insurance premium increases. Matt Williams (portfolio manager Airlie Funds Management) is of the view that the insurers are already preparing for the introduction of this policy and that the question investors must ask is whether the health insurers, or the hospitals will have the upper hand in negotiating prices. Who has the upper hand will determine whether the insurers can operate under this policy without a hit to their bottom line. He points out that insurers are already looking to reduce claims and keep people out of hospitals with a focus on greater recovery at home and other alternatives. The recent profit result from Medibank Private showed very tight cost control. Williams is also surprised that neither party as yet has committed to policy to write down the value of the NBN, thereby potentially reducing the price that NBN wholesalers, and by extension consumers, pay for their internet access. He believes it is likely that the next term of Government write down the value of the NBN. Such a write down would be broadly positive for the Telco sector as it could lead to higher margins for Telcos, which have struggled to generate a reasonable return from re-selling NBN. This is unless the price reductions were ‘competed away’ in a highly competitive environment. The Coalitions’ energy policy has ensured that the share prices of Australia’s energy retailers have been heavily discounted on the concerns of electricity prices being capped or companies broken up. Bill Shorten late last year also contributed to the uncertainty in energy policy suggesting the ALP will redirect east coast gas, earmarked for export, to the domestic market, if certain price levels (which weren’t disclosed) were reached. 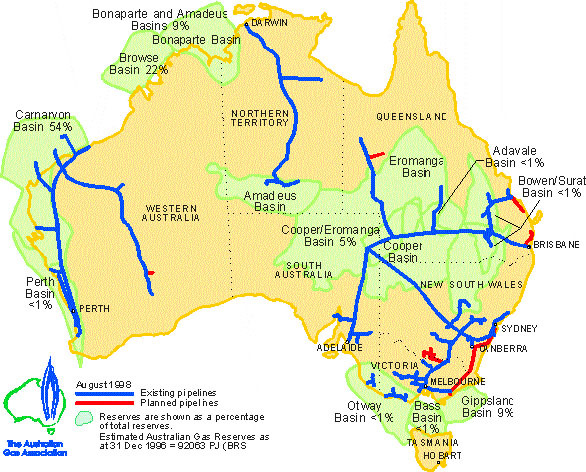 Australia’s gas producers have export contracts to deliver gas that usually spans decades. Investors are right to be concerned if a Government considered mandating that export contracts be put at risk in order to fulfil domestic demand. Williams believes that this uncertainty is creating opportunities to buy energy companies that are cheap as a result. It’s hard to be definitive about how to position investments for the Federal election at this stage, given that both major parties haven’t really put many cards on the table. What ends up being legislated is often not necessarily what is promised during an election campaign, so investors need to ensure they don’t over react too..
One thing however is certain, populist politics and business bashing is with us for the moment, and is likely to have material ramifications for investors. Investors must respond by paying more attention than usual to this years’ Federal election. For the last two years, we were feeling rather lonely suggesting that the property boom would end abruptly. Today, property prices are falling, and we are no longer a lone voice. The question is: how much further will they fall? A number of changes are contributing to the declines in property prices. For a start, rising bank fund costs are leading to higher mortgage rates. Then there’s a tighter definition of responsible lending following the Royal Commission – which will mean fewer individuals qualifying for a loan to buy property, and those that do get a loan will receive less. And on top of that, there’s been the introduction of lower debt-to-income limits and a wave of borrowers being migrated from interest-only loans – which hit a peak of $159 billion in 2015 – to principal and interest. These structural changes will continue to impact property prices for some time. One indication that prices might fall further than the 10 to 15 per cent suggested by some of my fund manager friends, is recent research produced by UBS that suggests the sanguine attitude held by borrowers towards their loans is misplaced. The research reveals a widespread lack of knowledge exists among borrowers about the terms of their interest-only loans and the extent of the increase in repayments that will need to be made when they are moved onto principal and interest. UBS has uncovered some startling facts. When asked why borrowers took out an interest only mortgage, 18 per cent responded they “can’t afford to pay P&I”, 11 per cent said they expected house prices to rise and to sell the property before the interest only period expires and 44 per cent noted it gave them more financial flexibility. One can safely assume some proportion of the 44 per cent were also in the can’t afford P&I camp. When combined, there are a substantial number of borrowers who have taken out an interest-only loan for the wrong reasons. Moreover, many of these borrowers don’t understand the product they have been sold. Among owner-occupiers only 48 per cent understand their interest-only term expires within five years, which is the maximum term typically offered. Meanwhile 18 per cent observed they don’t know when their term expires and 8 per cent believe their interest-only term will last more than 15 years. A 15-year interest-only loan doesn’t exist. The serious problem, however, is not that many borrowers will be shocked by how quickly their life will change, it is how much it will change. 34 per cent of all interest-only borrowers stated they “don’t know” how much repayments will rise. Meanwhile, 53 per cent expect repayments to rise up to 30 per cent and only 13 per cent of respondents indicated they expect their mortgage repayments to rise more than 30 per cent. Repayments will rise by at least 30 per cent and that is without interest rate rises in the interim. UBS have gone a step further and calculated the step up for investors and owner-occupiers with a $600,000 interest only mortgage moving over to P&I. Depending on the duration of the principal and interest mortgage, the step up can be as much as 91 per cent! In other words for some borrowers repayments could double. Clearly, the majority of this cohort are unprepared or underprepared for the inevitable increases. But why are we concerned? And why are all these people being forced onto principal and interest loans? The answer is APRA, in response to the Financial System Inquiry some four years ago. APRA imposed on the banks a strict limit of 30 per cent of all new mortgages written that can be interest-only. In 2014 and 2015 up to 49 per cent of mortgages written were written on interest-only terms but when these loan vintages mature in 2019 and 2020, only 30 per cent, including any brand new mortgages written, will be permitted to be on interest-only terms. Of course the banks are fully aware of this situation and they understand that because it is the marginal seller of property – this weekend’s vendor – that will determine property prices for everyone, they must try to move as many people onto principal and interest that can afford it. That way those who can least afford the step-ups will be extended another interest-only loan for a further five years. No wonder some of my friends who have mortgages – some have used them to fund purchases of real estate in Japan’s ski resorts – are already being asked to move over to P&I. By doing so it reduces the pressure on the banks to force people across who can least afford it. Inevitably of course this creates an overhang of property that acts like a ceiling on prices at least until the next wave of buying breaks through it. Until then expect even lower returns from residential property than those returns that were already locked in by paying a very high price. Over the past few months, rising energy prices have dominated newspaper headlines, treating readers to the sight of politicians wringing their hands, promising to get to the bottom of this issue and find out who is responsible. Large power generators, energy retailers and transmission companies are accused of being behind the rising cost of lighting, heating and cooling our nation’s homes. Whilst the profits that companies such as AGL Energy, Spark Infrastructure and to a lesser extent Origin Energy have increased over the past decade, we see that a significant proportion of the increase can be attributed to energy decisions made by various governments. As an economist, these price increases were predictable based on changes in the supply and demand curves of energy in Australia. There is scant evidence that they are the result of a long-term insidious plan by energy companies to capture a greater share of the nation ’s pay packets. In this week’s piece, we are going to look at energy prices impacting Australia’s consumers and industrial users alike. 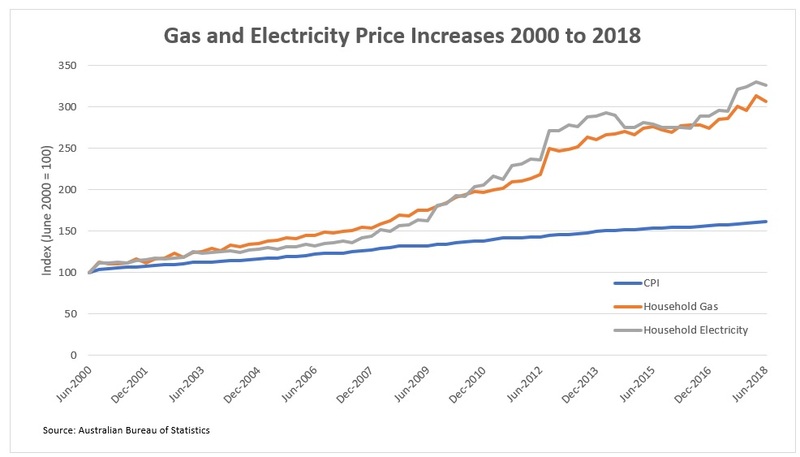 The above chart shows household gas and electricity prices in Australia and compares them to inflation. Using June 2000 as the baseline year, the CPI [Consumer price index which measures the prices paid by consumers for a basket of goods and services including energy] has risen by 61%. Over this same period, electricity has risen by +226% and natural gas by +207%. As you will note from the above chart, energy price rises roughly matched inflation up until 2008, however energy prices have accelerated in relation to CPI particularly since 2012. It is worth noting that electricity prices are influenced by natural gas prices in that gas is used in gas-fired power peaker plants that can be fired up in response to peak periods of electricity demand. Due to the size of the Australian continent and the absence of pipelines linking the major fields off the coast of WA with Eastern Australia, gas prices are greatly influenced by geography. As you can observe from the below table, due to the lack of physical infrastructure WA’s gas from the giant offshore LNG fields is sold to consumers in Seoul and Tokyo rather than Sydney and Melbourne. Until the construction of the construction of three liquefied natural gas (LNG where natural gas is cooled to -161 C to allow transportation) in the last five years, producers of natural gas on the East Coast of Australia could only sell their gas into the East Coast domestic market. This resulted in gas being priced below world prices for East Coast consumers. For example, in 2008 the wholesale price of 1 gigajoule of natural gas was $15 in WA versus $5 in NSW. The opening of these three export LNG plants in Gladstone in Queensland by Origin Energy, Santosand BG in 2015 and 2015 allowed the export of natural gas from Eastern Australia to Northern Asian customers that were willing to pay over $10 per gigajoule. Additionally, unlike in WA which mandates that 15% of gas produced in the state is reserved for domestic consumers, no such gas reservation scheme was enacted on the East Coast of Australia. AGL’s plan to construct an LNG import terminal by 2020 to serve the Victorian gas market will further link the prices that Australian consumers pay for natural gas to the world market, with gas expected to be imported from the USA and Qatar. Consequently, with a new source of demand for natural gas being introduced and East Coast gas markets opened up to world prices, domestic prices naturally gravitated towards the higher export price. The construction of these three LNG export terminals has not only had negative consequences for consumers but due to the elevated construction costs of around $71 billion have also been a burden for shareholders with returns below expectations. At the same time that demand for natural gas was increasing, a range of decisions were made by governments in NSW and Victoria to restrict new supply. Arguing about the benefits and harms of coal seam gas is beyond the scope of this piece, but economics dictates that if demand is going up and supply is unchanged, prices will naturally rise. In 2012 Victoria imposed a moratorium on coal seam gas exploration and in 2015 the NSW government banned new gas exploration. This saw AGL announce that it would not proceed with their projects in NSW and that they would be relinquishing their exploration licences. This action contributed to the energy company recording an impairment charge of $640 million in 2016. We note that in April 2018 the Northern Territory reversed its ban on gas exploration outside towns and conservation areas in a move designed to put downward pressure on power bills. In the electricity market prices have been driven higher by the Federal Government’s Renewable Energy Target. This will require electricity retailers to acquire a fixed proportion of their electricity from renewable sources and is likely to result in 33,000 GWh of Australia's electricity coming from renewable sources by 2020. Politicians seem surprised that regulations have added to electricity costs, following the closure of coal-fired base-load power stations in favour of more expensive renewables. For example, in 2017 Energie closed the Hazelwood power station that had previously supplied up to a quarter of Victoria’s electricity and AGL have announced that they will be closing the 1,680-megawatt Liddell coal-fired plant in 2022. Whilst we recognise that burning coal to generate electricity releases carbon into the atmosphere contributing to global warming, it is also a very cheap and consistent method of generating electricity. Additionally, coal-fired power plants are well-placed to provide a base-load of consistent generation, as these plans can generate electricity continuously, without requiring the wind to blow or the sun to shine. Until the battery storage technology catches up to allow generators to store significant amounts of electricity, relying on solar and wind power generation requires natural gas-fired generation to step in to maintain consistent supply. As discussed above, this source of electricity generation is more expensive today that it was 10 years ago. Switching power generation to renewables – whilst socially desirable – comes at a cost, and this is reflected in higher energy bills. Further, in any market when supply is removed and demand remains relatively constant, prices tend to rise. This effect has proven profitable for incumbents who have generators, such as AGL Energy. Rising energy costs have impacted consumers and industrial users alike, but they have not arisen in a policy vacuum nor as part of a conspiracy. We see that they are the logical outcome of decisions that have changed the supply and demand for energy and that various companies have predicably acted to generate profit from these shifts. In the Atlas equity portfolio, we own positions in AGL Energy and Spark Infrastructure, both of which have benefited from changes in the energy markets in Australia over the past ten years. Neither of these companies are involved in the LNG export terminals that at this stage look to be a poor investment for shareholders. Livewire recently produced a video with Dan Moore (Investors Mutual) discussing the changes to Australian lending and the likely impact on the economy. Q. Are tighter lending standards having an impact and where is it being felt? Daniel Moore: We're definitely seeing the banks change their lending standards, particularly around loan to income ratios, which has been pulled back quite a bit. They're now sort of having a max of about six times income, which is reduction in the past. And that's having an impact on loan approvals and clearance rates of the market. Q. Self-managed super funds have been pulled back from some of their lending. Westpac initially, some of the other banks, is this another part of that puzzle and is it getting worse? Hamish: We actually are more focused on investor lending. The investors in Sydney and Melbourne were taking anywhere between 50 and 60% of total mortgage flow at the peak about a year ago, which by international standards is just a witheringly high number. There's no international precedent for numbers anywhere near that high. So, it's true that the banks are pulling back from lending to self-managed super funds for real estate. At Watermark, we're much more focused on the impact of investors pulling back. The work that we've done suggests that borrowing capacity of investors is down anywhere between 10 and 20% and we think it's going to keep going. We know from channel checks with mortgage brokers that not all of the banks have rolled out the new loan serviceability requirements, they will do throughout the rest of the year. So the tightening should continue to go in our view. Q. So a negative for the economy or is there something positive we can say about it? Hamish: No not really. I guess long-term it rebalances the economy and millennials can afford a house. If you're a millennial that's probably a positive. So, lower house prices impacts the economy in a bunch of different ways. Directly it's through something called residential investment. Residential investment is building of new houses, renovating existing houses, and dwelling transfers. And there's a lot of literature that says when that peaks as a contribution to GDP as it has done in Australia about 12 months ago, that's a very good leading indicator for an economic slowdown and usually a recession. So there's not a lot of good news about the housing market and residential investment rolling over. Q. Daniel, housing affordability getting better certainly helps and makes the economic story a bit more sustainable, is that a positive or is there absolutely none as Hamish is suggesting? Daniel: I think the one positive you can say is that the royal commission happened before the crisis rather than after. Improving lending standards is a good thing, but there's no doubt the short-term impacts are negative. There's a very close correlation between house prices and household gearing level. So as banks are less willing to lend consequentially you would expect house prices to fall. Improving lending standards is a good thing, but there's no doubt the short-term impacts are negative. Q. If we're looking at the ASX listed stocks who is going to be most affected by this, and what should we be aware of there? Daniel: So if you look at probably the leading ... so the companies that are right at the pointing end, so the companies that are leveraged to house prices, or new housing. We sort of look at the property developers, we look at building material companies, and probably the retail sectors which sell household goods particularly the most expensive household goods. Q. So into that discretionary side, what are the areas that are really flashing red lights for you? Hamish: I wouldn't disagree with anything that was said before. Most of the work that we've done that informs our view on Australian housing and its impact on the economy was based on what happened in the Netherlands and the UK earlier in the decade. And exactly as described, the mortgage banks actually do reasonably well, it's the rest of the economy that disintegrates. So, retailers go bust, commercial real estate collapses, people stop going to the movies, people stop going to restaurants, but they pay their mortgages. So, we're focused on many of the same areas. The mortgage banks actually do reasonably well, it's the rest of the economy that disintegrates. Q. What would you do portfolio wise? Are there things you'd sell if this thing was going to take hold? Hamish: Again, what you would sell is reasonably obvious. I think the one area that might be a little counter consensual is owning the housing banks. So again, when we looked overseas in the Dutch downturn houses prices fell about 20%, the banks lost four basis points on their mortgage portfolios, which is not a lot. That same number in the UK was six basis points, which is not a lot. And in Sweden it was about one basis point. To answer your question in an interesting way, a counter consensual view that we have is that the housing banks actually will do reasonably well in this scenario, and then the businesses that will do badly are the ones that we described before. Q. Daniel you mentioned some of the housing stocks, building materials, any of those particularly a sell for you at the moment? Daniel: I think if we think of the building materials companies, the one that's most exposed to residential housing in Australia is CSR Limited (ASX: CSR), so despite the multiple looking quite reasonable we think those earnings are at the top of the cycle. In terms of retail probably the stock that's right at the pointing end, which has had a really good run in terms of earnings growth is Nick Scali (ASX: NCK), they're a furniture retailer. So they're probably two stocks we think are right at the pointy end. So they've had a good run and now it's time that things are changing. Not all investments are as safe as houses. As we move closer to Treasurer Scott Morrison’s third budget, what we do know is this - Australia has a revenue problem. A more global and digital economy; an ageing population with fewer taxpayers and sluggish wage growth make future predictions of revenue even more precarious. There’s never been a better time for tax reform. Income tax has contributed most to this growth and some is driven by rising wages and jobs growth. Between 2009-10 and 2016-17, individual income tax revenue grew by 37% - an average of 5% each year. The growth in business tax revenue leading up to the global financial crisis was heroic – averaging 11% each year and well above any budget forecasts. In the ten years to 2007, business tax revenue grew by almost 130% - from A$41.4 billion to almost A$95 billion. The Howard government’s new tax system in 2001 was an answer to this. This new tax system seemed to have all the reform solutions needed - income tax cuts for hard working Australians and at long last the introduction of a goods and services tax, along with some pretty big welfare reforms. But fast-forward 10 years and cracks began to show, prompting a new review into the effectiveness of Australia’s tax system. The Henry Review, provided some 138 recommendations for tax reform, yet very few saw the light of day. And just five years later, another review was conductedwith then Treasurer Joe Hockey at the helm, which since seems to have been not so much parked as abandoned. South Australia’s new bank levy, projected to earn A$370 million over four years, seems to be constitutionally valid but it remains hostage to political machinations. While precise details are sparse, the Major Banks Levy will target those institutions liable for the Commonwealth bank levy (Commonwealth Bank, ANZ Bank, Westpac, National Australia Bank and Macquarie Bank). It will impose a state levy of 0.015% per quarter of South Australia’s share (about 6%) of the total value of bank liabilities subject to the federal government levy. By making Commonwealth grant payments conditional on the removal of a levy, the federal government could force South Australia to abandon its bank levy. It’s here that South Australia can benefit from the cover provided by the federal government’s bank levy. The federal government would be forced to tread a very tight line if they try to argue that it is fine for them to tap the banks’ honeypot but not for the states to do it too. With new sources of state funding rare, South Australian treasurer Tom Koutsantonis has exploited this political opportunity, potentially signalling a shift of power back to the states. Unsurprisingly, the banks have reacted with fury, mounting their own attack campaign and threatening reprisals. The constitutional validity of South Australia’s bank levy rests on the distribution of taxation powers in the Australian federation. The power of the states has been eroded over time as the Commonwealth gradually came to dominate the federation. The Constitution assigns almost equal power over taxation to the states and the federal government. Under Section 51(ii) the federal government is granted a power to enact laws with respect to taxation, but “not so as to discriminate between states or parts of states”. However, Section 90 grants the federal government the exclusive power to impose “duties of customs and of excise”. So a state tax will generally only be constitutionally invalid if it’s characterised as a duty of custom or excise, or if it is incompatible with a Commonwealth Act. Back in 1942, the federal government used its power under Section 96 to gain an effective monopoly on income tax. Under the scheme, the federal government levied a uniform tax on income, then gave a grant to the states equal to the income tax they had collected on the condition they cease collecting income tax. In South Australia v Commonwealth (1942), the High Court upheld this effective takeover of income tax. While states retain the right to levy income tax, the risk of losing Commonwealth grants (together with administrative cost and competitive pressures) has made the proposition unattractive. The federal government has consolidated more power through the expansive definition given by the High Court to the meaning of “duties of excise” in Section 90. For example, in the court case Ha v New South Wales (1997) a majority of the court held that duties of excise are taxes on the production, manufacture, sale or distribution of goods. As this is an exclusive federal government power, the states are effectively prohibited from taxing goods – such as sales tax. The states have instead been forced to rely on a range of relatively inefficient transaction taxes (that is, stamp duties on certain written documents), on land taxes, and on payroll tax (levied on the wages paid by employers). The narrow base of these taxes has seen the federal government come to dominate taxation revenue – collecting more than 80% of tax revenue in 2015-16. …scrounging for revenue in economically inefficient or socially undesirable ways and going cap in hand to the Commonwealth. With opportunities for the states to introduce new forms of taxation being so limited, the proposed South Australian bank levy is something of a game-changer. The levy’s structure doesn’t appear to involve the taxation of goods in a way that would go against Section 90 of the Constitution. The banks are being taxed on the basis of the value of an asset class they hold – in a way that is comparable to land tax. Given the small percentages involved, this levy does not seem to interfere with the federal government’s levy, and would arguably not be incompatible with it. While relatively novel, the tax appears on its face to be constitutionally valid. However, the politics of the issue is far more vexed, as the dark shadows of the federal government tied-grants scheme loom over all matters involving state tax. As Western Australia has learned, raising state taxes can have catastrophic unintended consequences. After that State raised mining royalties during the mining boom, the Commonwealth Grants Commission drastically reduced its share of GST payments - down to 34 cents in the dollar. The fate of the state levy remains uncertain, with the politics very much in flux. What is clear is that the other states are taking notice. With growing frustration over fiscal dependence on the federal government, it seems we may be entering a new phase of innovation in state taxation. Perhaps the federation is not yet dead. Platinum Asset Management's quarterly report is always full of insightful information about the world economies and financial markets. The most recent quarter considers the imbalance of investment capital around the world, comparing the economies of US, UK and Australia who all are spending above their income levels (running deficits) versus economies in Europe and Asia who are spending less than their income. It is indeed thought provoking from the perspective of an Australian investor. While quite a detailed read, we thoroughly recommend investors take the time to run through this excellent document that is put together by the professional investors who manage the money at Platinum rather than marketing spin doctors. You can download your copy of the report by clicking on the image below. http://www.ampcapital.com.au/custom/reskin/images/bg-bullet-dot.png); padding-left: 11px; margin-bottom: 5px; background-position: 0px 8px; background-repeat: no-repeat no-repeat;">Consumer spending is heavily constrained by record low wages growth and high levels of underemployment resulting in real household disposable income growth of just 0.4% over the last 12 months. While real consumer spending grew more strongly than income at 2.3% over the last year, this was only possible because of a fall in the household savings rate to 4.7% from 6.9% a year ago. Rapid increases in the cost of electricity, talk of an increase in the Medicare levy and high debt levels are probably also not helping. All of which is showing up in relatively low levels of consumer confidence. http://www.ampcapital.com.au/custom/reskin/images/bg-bullet-dot.png); padding-left: 11px; margin-bottom: 5px; background-position: 0px 8px; background-repeat: no-repeat no-repeat;">The housing cycle is starting to slow. Falling building approvals point to a downtrend in housing construction activity (see next chart). Similarly, the wealth effects from home price gains are likely to slow if, as we expect, Sydney and Melbourne property price growth has now peaked under the weight of bank rate hikes, tighter lending standards, rising supply and poor affordability. http://www.ampcapital.com.au/custom/reskin/images/bg-bullet-dot.png); padding-left: 11px; margin-bottom: 5px; background-position: 0px 8px; background-repeat: no-repeat no-repeat;">The big drag on growth from falling mining investment is nearly over.Mining investment peaked at nearly 7% of GDP four years ago and has been falling at around 30% per annum, knocking around 1.5% pa from GDP growth (and a lot more in Western Australia). While it’s still falling rapidly, at around 2% of GDP now, its weight in the economy has collapsed reducing its drag on growth to around 0.5% for the year ahead and it’s getting close to the bottom. http://www.ampcapital.com.au/custom/reskin/images/bg-bullet-dot.png); padding-left: 11px; margin-bottom: 5px; background-position: 0px 8px; background-repeat: no-repeat no-repeat;">Secondly, public infrastructure investment is rising strongly, up 9.5% over the last year, in response to state infrastructure spending much of which is financed from the privatisation of existing public assets. http://www.ampcapital.com.au/custom/reskin/images/bg-bullet-dot.png); padding-left: 11px; margin-bottom: 5px; background-position: 0px 8px; background-repeat: no-repeat no-repeat;">Finally, net exports or trade is likely to return to contributing to growth as the impact of Cyclone Debbie fades, resource projects including for gas complete and services exports continue to strengthen. With SA Treasurer, Tom Koutsantonis announcing in the budget recently, a state based bank levy, we examine his assertions in a game of "Fact or Crap"
1. Tom Koutsantonis asserts that a new tax on the banking sector will ensure 'the sector contributes their fair share'. The fact of the matter is that last year alone, the banking industry paid over $14bn in tax. In terms of tax paid, it is banks first, daylight second. Banks make the highest contribution by far to help governments at all levels fund essential public services such as hospitals, schools and roads, and income support for those in need. In fact, banks paid 55.3% of all tax paid by Australia's top 200 listed companies. Food and Staples retailing paid 5.4% and the Metals and Mining industry paid 3.8%. Source of this information is special report published by Australian Bankers Association. Therefore we declare Tom Koutsantonis' first assertion is CRAP. 2. Tom Koutsantonis asserts that banks are earning super profits and therefore should pay more tax. If banks in Australia truly were earning 'super profits' investors would clearly be able to see a material increase in financial ratios such as bank margins, and return on equity. The first chart shows return on equity over the past 30+ years. If banks were earning super profits this graph would show an increased return on equity, whereas the fact of the matter is that return on equity has been relatively stable over the past 30 years. And while Australia's banks are profitable, this is something that Australians actually benefit from not only in their superannuation fund investment returns, but also having access to credit from a stable financial system to purchase houses, cars, businesses etc. The second chart shows the journey of bank interest margins over the last 20 years. If banks were making super profits, margins would not be decreasing which is clearly what the chart demonstrates. Tom Koutsantonis' second assertion is also CRAP. 3. Tom Koutsantonis asserts that banks should pay extra tax as they have closed branches. Arguing an organisation which rationalises its physical locations should pay higher tax liabilities would result in some interesting tax outcomes for the likes of Book stores, Record/CD shops and of course Video rental shops that have all changed materially at the hands of technology. Australia has one of the highest rates of bank branches to populations in the world, and it is with this in mind that we declare that Tom Koutsantonis' third assertion is also CRAP. And for further interest from the same IMF report, Australia has 164 ATM's per 100,000 adults, providing ease of access to cash. This compares to OECD average of 75.9 ATM's per 100,000 adults, further demonstrating that banks provide an above average service to Australians. GEM Capital believes it is poor policy to single out an industry and impose a specific levy in a particular geographic location. This is likely to distort the integrity of the tax system in Australia and lead to poor economic outcomes for South Australia. "My concern is that it will damage investment. It's quite a different set of circumstances from the federal tax". "A state based levy could make the region uncompetitive" - Nick Xenophon, who is opposing the SA Bank Levy. GEM Capital is concerned at the anti-business messages the SA Government is promoting in this levy and believes it is highly likely to result in reduced investment in South Australia which is likely to result in reduced employment over time. From an investment perspective, actions of Australian Governments like this are materially increasing "Sovereign Risk" of investing in Australia which is also likely to negatively impact the Australian economy over time. It very much validates our view to look to continue to invest outside of Australia in search of investment returns. These opinions are my personal views and not necessarily those of the Dealer Group we are licensed through.